Located in Lujiazui area of Pudong District and adjacent to the famous Oriental Pearl TV Tower and Jinmao Tower, Shanghai Ocean Aquarium is the biggest sea aquarium in Asia which covers an area of about 13,000 square meters with a total construction area of over more than 20,000 square meters. 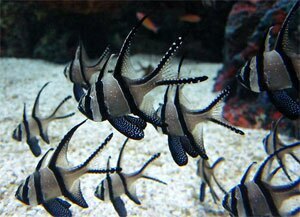 Shanghai Ocean Aquarium is designed to provide the insight in almost all sea species that can be found in Asia. It is divided into eight major exhibition area: Biological, Sub-Asia, South America (Amazon), Australia, Africa, Cold Water, Polar sea and Ocean Depths area. The exhibits include more than 300 varieties, 15,000 water creatures and article of rare fish and endangered species of rare animals, including the most special ones like is the frog Du Jian, jellyfish, bluegill, Ye Hailong, the emperor penguins and albino Agkistrodon perch. 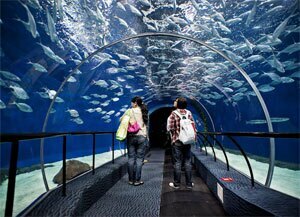 The Shanghai Ocean Aquarium has a setup of 4 underwater tunnels which allow 180 or 270 degree view of the marine wildlife. The total length of these tunnels is 168 metres and they are rated the longest submarine tunnels in the world. The setup of the observation windows allows you to experience the underwater surrounding without getting wet. Admission Fee: RMB 160 per adult person and RMB 110 per child between 100 and 140 centimetres in height. People with disabilities and elderly citizens are allowed in at much lower prices than the regular ones as well.